The reality of marriage has become obscured today because of the influecences of relativism and the secular culture. It has been diminished for many as merely the public recognition of a loving committed relationship for the private interest of a man and a woman. The following essay helps focus on the reality of marriage as a foundational part of God's plan for creation, and the Catholic understanding of its sacramental nature. "Celebrate the Reality of Marriage"
for use in parish marriage recognition events, wedding anniversary celebrations, or for discussions in families and organizations. for use during Prayers of the Faithful in parishes, by organizations, as intentions with decades of the Rosary, or for use in family prayer. The marital embrace of Sts. Joachim and Anne. This icon is venerated by Eastern Catholics to celebrate the Immaculate Conception of Mary, the Mother of God by her mother Anne. These are "the grandparents of God." The beauty of looking at marriage in this way is that it helps us become aware that marriage, as God intended it, is a reality that can be understood without the benefit of faith. It can be understood by anyone. Concepts discussed, like the irreplaceability of a man and a woman in marriage, may startle some, since many people today do not enter marriage with that thought in mind. 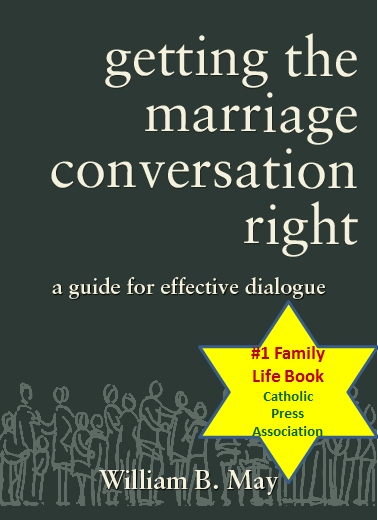 Talking about the reality of marriage in non-religious terms, not only helps people understand its reality better, but offers young people ways of discussing marriage with peers that can provoke thought and reduce the exposure to negative reactions that are so prevelant today.The essay can be adapted to homilies, for other uses in parishes, or for marriage recognition events sponsored by organizations. Using formation materials and reflections developed by the Marriage Reality Movement, Go Deeper in study and faith sharing groups can help parishioners learn more about the reality of love, marriage, family, and human sexuality, and become better prepared for evangelization of culture on marriage and family. The work of rebuilding a marriage culture starts with family members, friends, and fellow parishioners. Marriage unites a man and a woman with each other and any children born from their union. Until a man and woman marry, everyone outside of their family and outside of marriage is replaceable and interchangeable, even closest friends. But marriage is different because when a man and a woman marry, they freely chose to make themselves irreplaceable and non-substitutable to each other. This is important because parents are irreplaceable to any children born from their union – if children are deprived of their parents’ love or of knowing and being cared for by them, there is a natural sense of loss –a longing. It is, therefore, fitting that they first chose to make themselves irreplaceable to each other. By making this choice these couples have prepared themselves to receive the gift of new life – a child of equal value and dignity to themselves. The human person is a manifestation of God’s infinite love, a person called by name and destined for eternal life with God, a person of greater value than the entire universe added together. This is the reality of marriage that is recognized in different ways by every culture, by every religion, and by every government. The institution of marriage is a universal recognition of God’s plan for creation. It is a reality that does not depend on faith or revelation. In reality, it forms a circle of irreplaceability or kinship – it is the very foundation of the family. However, we as Catholics understand that marriage is more than a recognition of God’s plan for creation. We know it as a visible sign of an invisible reality –what we call a Sacrament. We see the marriage, we see the husband, and we see the wife, but we know from scripture and the teaching of the Church that man and woman are made in the image of God and when joined together, they become like an image of the Blessed Trinity, and like the Trinity, the marital embrace is life giving. This is a sacred invisible reality. In the Trinity, Christ pours himself out and gives himself in love to the Father. The Father receives the love of the Son and in return pours himself out in love to the Son. As a result we discover a third person– the Holy Spirit who proceeds from the Father and the Son. The marital relationship is similar – the husband receives his wife as a gift of infinite dignity and completely gives himself to his wife. She receives his love as a gift and completely gives herself to her husband. In the marital embrace, the man and woman become almost like another person, a potential creator, from which flows a new person created in the image of God. The child is an eternal witness to that union, carrying the flesh of his or her mother and father. In reality, every person without exception is an eternal witness of the one-flesh union between their own mother and father. Although they have prepared themselves to do so, not all married people have received the gift of children. We honor them because by preparing themselves to receive life as a gift, they are able to live out their vocation of love in marriage and serve the community in other life giving ways. Another way for married men and women to receive life as a gift is to adopt a child who has been deprived of his or her own mother and father. Everyone without exception has a mother and father, and only a man and a woman can stand in and assume the responsibilities of a mother and father who were not able to care for their child. Because a married couple has chosen to make themselves irreplaceable to each other, they have prepared themselves to receive a child through adoption as a gift and make him or her irreplaceable to both of them. Adoption by a married couple is a beautiful example of receiving a child, making the child irreplaceable and unconditionally loved without doing anything to deserve it. This again is like the Trinity and reflects the unconditional love of God. 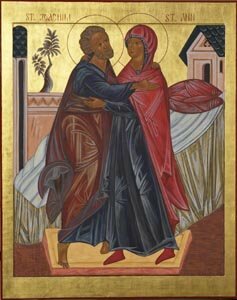 The father and mother as unique persons and united spouses witness Trinitarian love. Marriage is also a symbol of the relationship between Christ and his Church. He is the bridegroom and we are the bride. He poured himself out completely on the cross for each of us and our salvation. We did nothing to deserve it. We make a free choice to receive that gift of love and return that love by giving ourselves to him. Through the Eucharist, we enter into communion with him and the Trinity by approaching him in faith, receiving him as gift and giving ourselves to him. In a similar fashion husbands bring love to their wives. Let us pray for married couples, especially those present here. We give thanks to God for them and their response to their marital vocation. They are a blessing by bearing witness to love. Let us always encourage them in their vocation and pray for them. May God grant them the grace to live in integrity. We pray for the grace to support them in their marriage and to support others who are called to this vocation. We pray this in the name of Jesus Christ. Amen. William B. 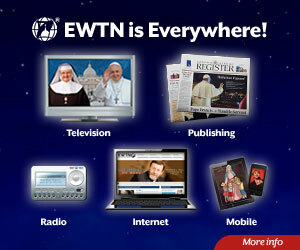 May is founder and Cheif Mission Officer of Catholics for the Common Good Institute.